although i’m not a big fan of RPGs, i’ve been intrigued by level-5’s guild series, which draws upon major talent to create indie-sized games. a couple of months ago i played and enjoyed liberation maiden, one of the games in the first collection, and based on the glowing review at nintendolife i picked up crimson shroud, also from the first collection. the game ended up being more like a typical RPG than i had expected. its main designer, yasumi matsuno, was the director and writer behind the enjoyable final fantasy tactics, and there are some things the two have in common, including a plot revolving around a religious organization and a typically final fantasy active time battle system. It’s fairly normal these days for an RPG to have a massive scale, even when presented on a hand-held platform. Those games are certainly fun, but I wanted to create a compact game that didn’t require such a time investment, more geared toward adult players. The game is best enjoyed while relaxed, as though you’re sitting down with a short story. the game is nice and compact, clocking in at around 7 to 9 hours, with a much more difficult new game plus mode unlocked after beating the game for the first time (more on that later). the three characters fit into standard RPG archetypes (warrior, archer/red mage, and mage/healer), and along with attacks (weapon or magic), each turn characters can also activate a skill, which is pretty much just another magic attack, mostly centered around “buffs” (e.g. increase in weapon accuracy, defense, etc.). each skill is associated with an element (fire, lightning, etc.) which play into the game’s only rather-simplistic combo system, achieved pretty much just by stringing together skills of all-different element types. doing so earns you dice, which feed into the game’s supposedly biggest hook, the “tabletop RPG” design. i haven’t played a tabletop RPG, but the influences are clear. instead of fully animated 3-D character models, the characters are represented as figurines that don’t move at all. also, as this person on gamefaqs succinctly puts it, “most of the story is narrated to the player rather than told through cutscenes” (so much so that hardcoregaming101.net goes so far as to call the game “half RPG, and half interactive novel”). dice supposedly also play a prominent role in the game, in that at various points you’re called upon to make a decision (e.g. try to dodge an arrow in a story segment or activate a skill in battle) and then roll dice to determine if your action succeeds or fails. the penalties for not succeeding in your dice roll are minor, though, so that mechanic doesn’t seem very well integrated aside from adding to the tabletop RPG flavor. the more-interesting mechanic from a gameplay perspective is that in battle you can build up a store of dice and then add them to actions such as weapon attacks, which basically means you have a pool of extra resources to call upon when you want. building up your pool of dice and deciding when to use them makes battles feel slightly more interesting than more-generic RPGs, although not enough to make the overall experience feel truly unique, i.e. you’ll still be attacking with swords and shooting arrows, counteracting poison and other ailments, quaffing potions and revives, and casting plenty of fire and heal all spells. the game also includes a forging mechanic where multiple copies of the same weapon can be combined and where spells can be grafted onto an existing weapon, which is nice to have but also fairly standard RPG fare. the story is interesting enough, and not having played an old-school RPG in a while i didn’t mind the fairly traditional battle mechanics given the game’s short length, but i definitely wasn’t motivated to play the new game plus despite the promise of a significantly increased challenge. apparently the NG+ also offers new rooms and battles as well as a better ending (for a discussion of both endings, including the somewhat curious/confusing first ending, see this discussion on gamefaqs). on the site matsuno mentions that “characters grow stronger by finding new equipment instead of grinding for levels as the story unfolds”, although in practice it sounds like for NG+ in particular you’ll end up having to grind for the best equipment instead. 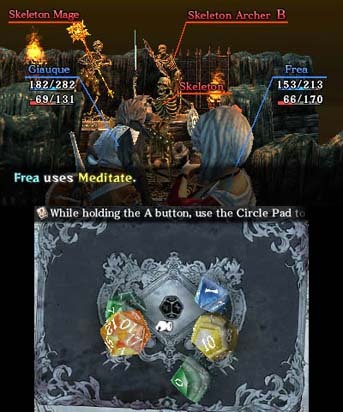 as it is, in the main game there’s a particularly notorious part (level 2 of the dungeon, specifically the gerseym waterway) where an essential item is only obtained via an item drop, which has been frustrating for many. all in all i enjoyed the game despite being less unique than i had hoped, and its short length ensured that it didn’t overstay its welcome, while still enabling its mechanics to be reasonably well explored. although screenshots look cluttered, the game looks great in glasses-free 3D and has a polished presentation. not one of the best games i’ve every played, but it’s reminded me that i haven’t played an old-school RPG in a while and has whet my appetite to tackle one of the classics, so hopefully i’ll get to that before too long. – the japanese-language version (included in the NA release) apparently has all-new dialogue in new game++ not included in the english version. it looks like it’s a self-referential comedic edit, which would have been amusing. you can find a sample of it at this thread on gamefaqs.